Summertime is a wonderful season - school’s out, the days are longer, and BBQ parties are in full swing. It can feel like a time for carefree fun in the sun - at the beach, at the pool, or at a baseball game. However, due to all the outdoor activities, keeping your skin protected against harsh UVA and UVB rays is vital. 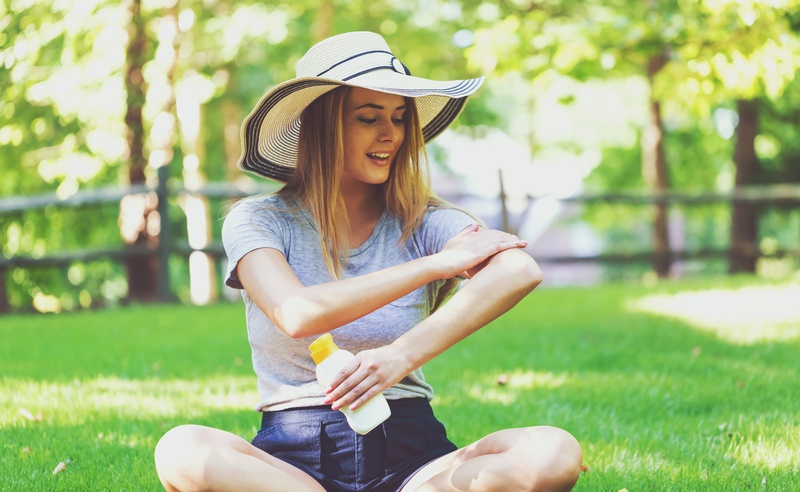 Here are our summer safety tips for keeping your skin healthy (and glowing) no matter what you have planned this summer season! Let us be clear - many people assume that if they don’t burn they just tan, then they are safe. In reality, tanned skin is damaged skin. Summer sun is no joke - UVA and UVB affect your skin differently, but both are harmful without proper protection. Long wave ultraviolet rays (UVA) can penetrate deep into the dermis, which is the skin’s thickest layer. Short wave ultraviolet rays (UVB) will usually burn the superficial layer of your skin - but they play a big part in the development of skin cancer. Overexposure to these rays of light does more than just cause skin cancer (which is bad enough). It can cause discoloration, dark patches on your skin called melasma, premature aging, and wrinkles. Suffice it to say, these are all bad things. However, you don’t have to hide out in a dark hole in order to prevent sun damage. Here are 3 summer safety tips that we swear by for skin protection. Sure, your makeup says SPF 15 or 20. But this is not enough! Make sure to wear a mineral or physical sunscreen that has an SPF of 30 or above. And reapply! Sweat and moisture (such as a spray of pool water or ocean waves) can wash it off in a hot minute. Trust us - the more sunscreen you wear now, the less makeup you’ll need to wear to cover up the damage in the future. Hats aren’t just for your dorky dad. Wearing a hat, especially during the hottest time of day between 10AM to 2PM, is so important for protecting your beautiful face and neck. Besides, hats are cute now - there are so many options! Ditch the outdated visor and get a big, beautiful sun hat that says “I’m on vacation”. Your skin will thank you. Beach cover-ups and umbrellas are a must. While sunscreen can minimize the damage, covering up your skin as much as you can is the best way to go. Yes, it’s hot and more clothing seems counterproductive - but investing in a breezy, adorable beach cover-up will save your skin and keep you from feeling stifled. Keep it on when you’re in the direct sun. Or, better yet, go Rihanna style and chill out under that beach umbrella, ella, ella. The more you can avoid being in the direct sunlight this season, the better. Plus, sitting under an umbrella at the beach is a perfect time to catch up on your summer reading! Already seeing signs of sun damage? If you are already seeing signs of sun damage on your skin, an aesthetician could be the answer. At LifeScape Premier, our skilled licensed aesthetician who specializes in medical aesthetics, Noelle Cesario, can identify the damage done and recommend tailored services to help you get your glow back. Check out our medical aesthetics services here and make an appointment with her today! You don’t have to hide out in a dark cave to protect your skin this summer! By following our summer safety tips and being mindful of the hottest times of day, you can prevent future damage. So SPF it up, get that cute hat you’ve been eyeing, and enjoy the heck out of your summer! Looking to have your best (and healthiest) summer ever? Book a Consultation with Lifescape Premier today!